Roasting a pumpkin whole not only saves me the hazard of losing a finger(they are TOUGH to cut), but it saves time. 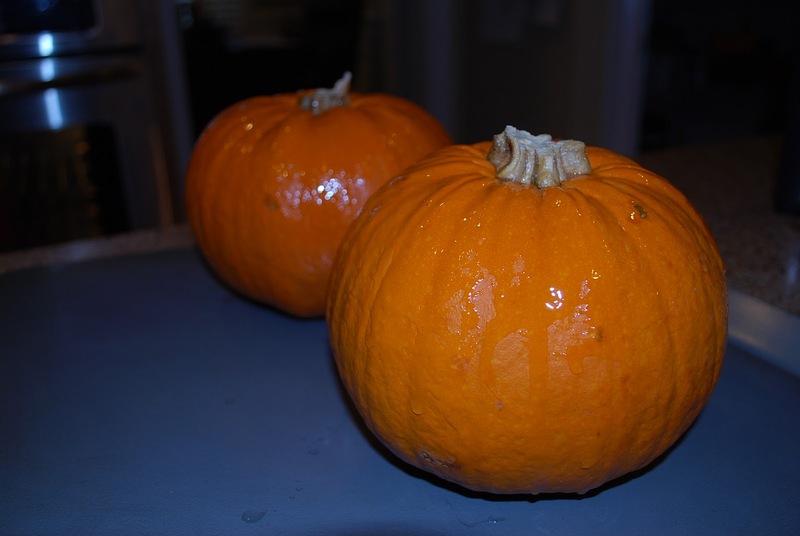 Fresh pumpkin is great for your Thanksgiving pumpkin pie and any recipes calling for canned pumpkin. Why not use those pretty pumpkins you had displayed on your patio? Make sure that they are fresh, and not carved. I love the small sugar pie pumpkins for roasting. Set oven to 400F. Wash pumpkin well and cut off the stem. Rub skin lightly with safflower or olive oil. Place a baking sheet on the lower rack below the pumpkin to catch any juice, then put the pumpkin directly on the rack above. Roast for 60 – 90 minutes. The actual time will vary based on the oven’s actual temperature, the moistness of the pumpkin, the variety of pumpkin. But it’s done when a knife slips into the flesh very easily. Let it cool a bit before slicing. Also, be careful when slicing open to avoid a steam burn. Perfectly cooked flesh! 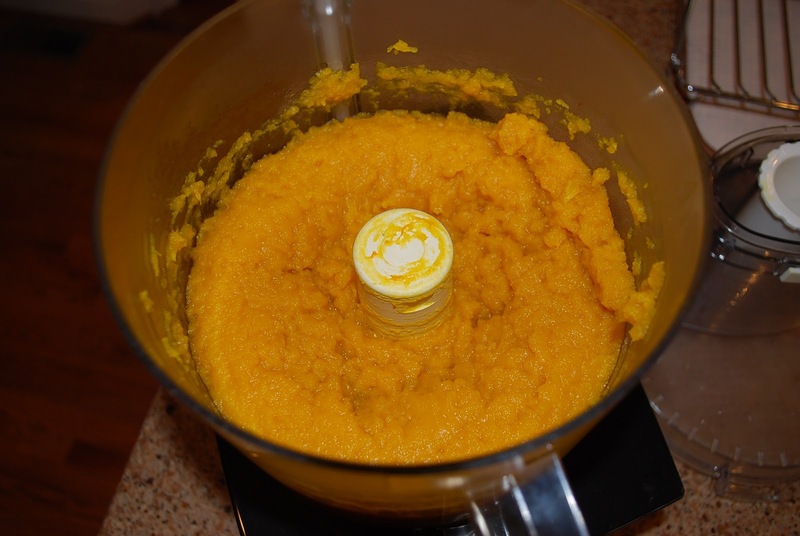 Scoop out the seeds and place pumpkin flesh in the food processor(fresh pumpkin is more fibrous than canned, so it needs to be put through a food mill or food processor). Place pumpkin in a fine mesh strainer over a bowl and let drain overnight. 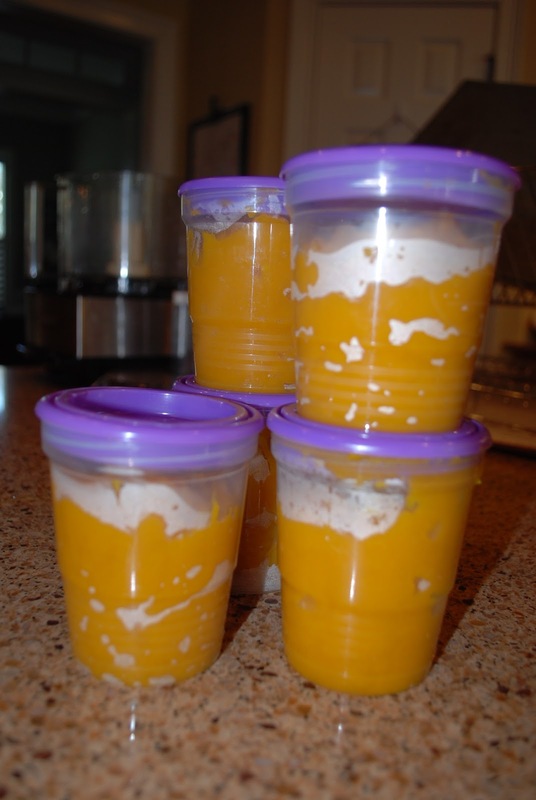 Pour into containers to freeze or put into ziploc freezer bags(make sure you squeeze all the air out of the bag) and freeze until ready to use. Thaw overnight in the refrigerator and use in your favorite recipes. Set oven to 400F. 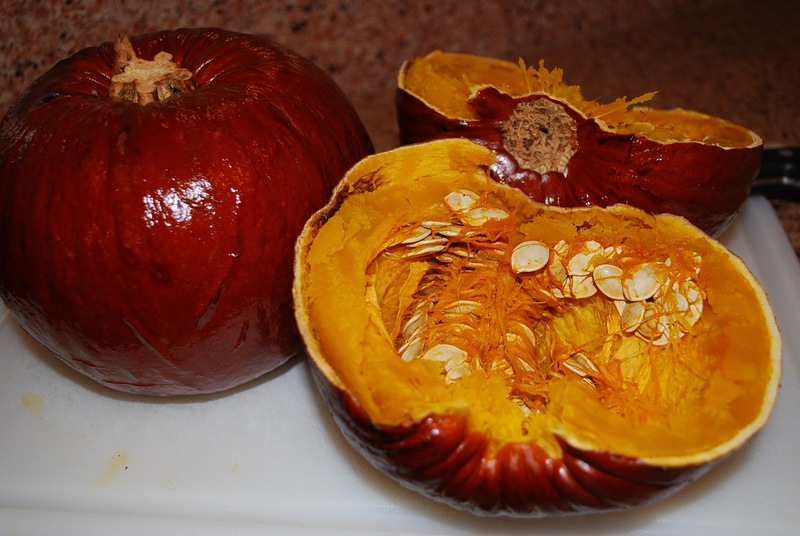 Wash pumpkin well and cut off the stem. Rub skin lightly with safflower or olive oil. Roast for 60 – 90 minutes. The actual time will vary based on the oven’s actual temperature, the moistness of the pumpkin, the variety of pumpkin. But it’s done when a knife slips into the flesh very easily. 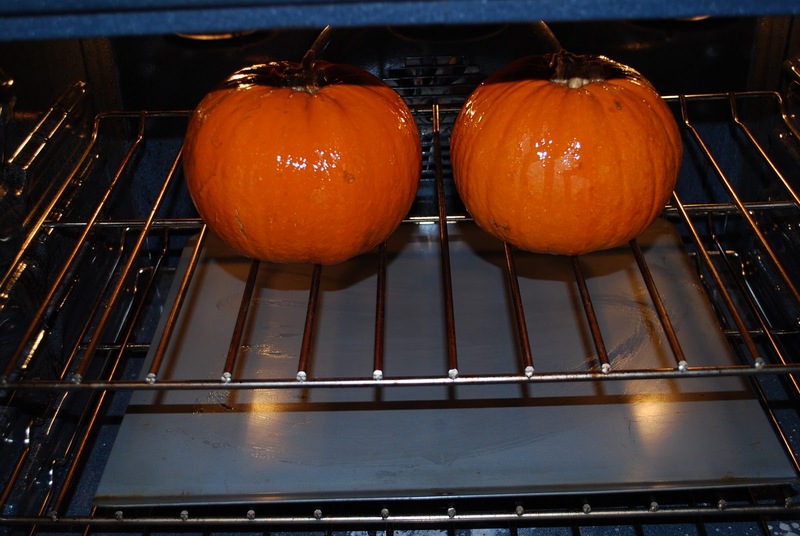 Remove pumpkins from oven. Let them cool a bit before slicing. Also, be careful when slicing open to avoid a steam burn. Scoop out the seeds and place pumpkin flesh in the food processor. 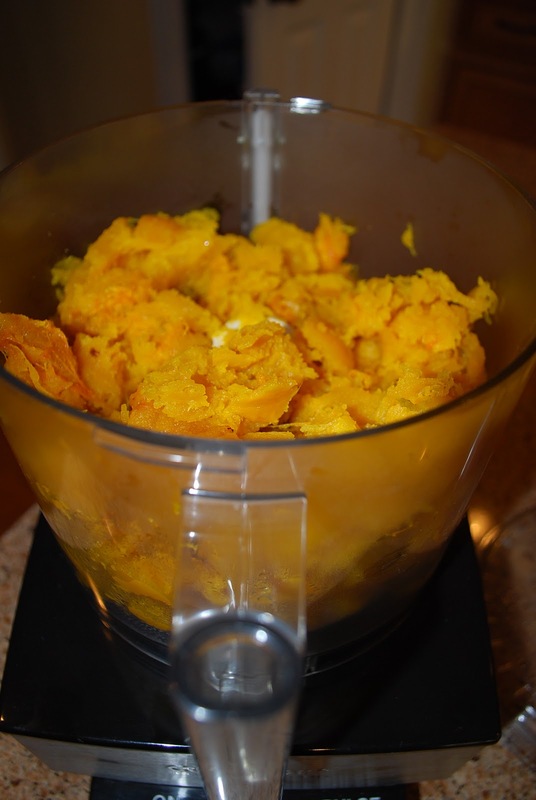 Fresh pumpkin is more fibrous than canned, so it needs to be put through a food mill or food processor.